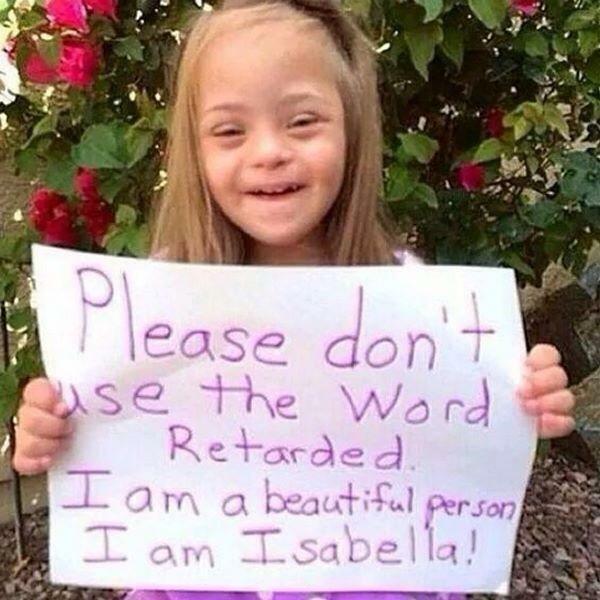 Retarded is a valid word. One should not call this girl “retarded” but her mental capacity is retarded. Retarded means less advanced in mental, physical, or social development than is usual for one’s age. It also means foolish or stupid. In point of fact, this little gal is “retarded” as she is less advanced in mental, physical or social development than is usual for one who is her age. Retarded is a word. Words are assigned value by humans who create them and use them. The mere fact that one person uses the word in a derogatory manner does not mean that the use of the word is universally derogative in nature. However, the insistence by the Left to assign permanent value to language is a bit of a sign of their cultural and societal retardation. Language evolves. Constantly. Language is nearly always in flux. The word “Ball” is perfectly illustrative of this phenomenon. 1. A round or other shaped object used in playing games. 2. An organized dance or other social gathering. 4. The act of playing basketball well. I am certain there are more examples that I could use here. In short, get over it liberals. Words are words. They have only the power that we assign them. Liberals are all too eager to assign to words some negative connotation and to thrust that definition on to society as a means of forcing conversations and controlling the narrative. We need no new victims. We need empowered humans who aren’t afraid to face the world.